Procession of the Dead is the latest novel from Darren O’Shaughnessy, writing under the pen name DB Shan. O’Shaughnessy is one of I r e land’s most successful genre authors – his children’s fantasy and horror series The Saga Of Darren Shan And The Demonata are on sale in 35 countries and in 28 languages. 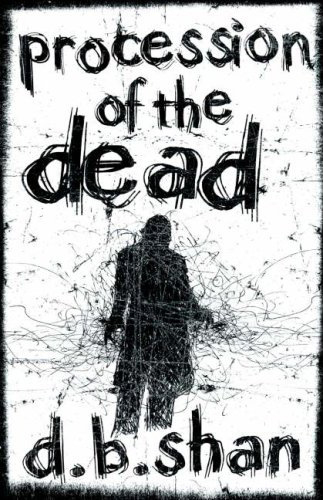 In Procession Of The Dead, Shan has turned his hand to writing for adults, and has taken the precaution of using a pseudonym to prevent children confusing this new book with his usual output. The story starts with Capac Raimi arriving in the city to apprentice himself to his uncle, a once great gangster now fallen on hard times. Raimi has an unusual name, derived from ancient Incan culture, and this quickly saves his life and brings him to the attention of the Cardinal, the larger-than-life mafioso who rules the city. The Cardinal’s tentacles are long and far-reaching, and nothing happens in the city without his saying so. Politicians beg for his backing, actors plead for help securing academy awards and popes come and go when summoned. The all-powerful Cardinal runs the city and, for some strange reason, he’s taken an interest in Raimi. Offered a job in the Cardinal’s organisation, Raimi is set the task of learning the firm from the ground up, starting out in the insurance business. Much to the annoyance of the Cardinal’s existing henchmen and hangers on, Raimi looks like he could be destined to become the organisation’s next leader and the headman’s heir. But all is not as it seems, and people close to Raimi start to disappear. This is not unusual in the city, but strangely, nobody but Raimi seems to notice they’re gone or even remember them. Raimi is compelled to investigate, but acting behind the psychotic Cardinal’s back is a very dangerous game. Procession Of The Dead is the first book of the City trilogy and was previously published under the name Ayuamarca in 1999. At the time, both this book and its sequel, Hell’s Horizon, received good reviews but didn’t sell well enough to remain in print, and the third part of the trilogy – City Of The Snakes – was never published. This time, however, O’Shaughnessy has returned to these adult novels and substantially rewritten them, drawing on the experience he’s gained as a writer in the last ten years. Aspects of the book betray its chequered past though – while the dialogue sparkles and rips along at breakneck speed, in places, the first person narrative descends into clunky and plodding description that is difficult to read and pulls the reader out of the story. This is part of the problem that authors face when they choose to write in the first person – all events in the story have to be related via the experience of the main character. It can be a real challenge to do this creatively enough to not have the reader become aware of the man behind the curtain. That said, in this case, the problem is forgivable, as the total package is well done and entertaining. The plot is excellent, with many twists and turns, and the technicolour cast of characters are as entertaining as they are repellent. With Procession Of The Dead, O’Shaughnessy has produced a macabre, yet stylish, dark urban fantasy that’s more than worth the cover price for fantasy fans who like their strangeness to have an urban noir feel.